Don’t let that happen. Here are some steps to take for enhancing your investment with outdoor lighting. The first step in any design process is to think about your objectives and plan accordingly. Outdoor lighting is no different. Begin with the basics and review your needs for these essential elements. Make a list of how you use the space you want to light and what your goals are for that space. Does the family spend a lot of time cooking out and eating on the deck? Do you entertain on the patio? Are pathways dark and hazardous? Is there a beautiful water feature you want to highlight? 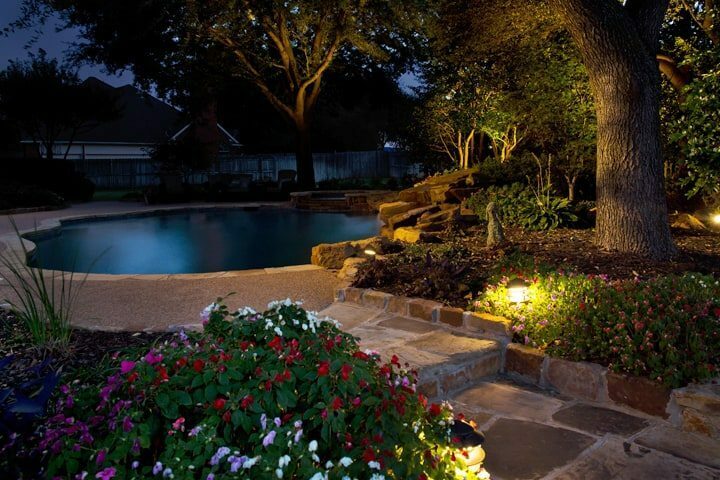 While most of your activities will take place in your backyard, don’t forget about outdoor lighting for the front. This is where you can create drama and striking curb appeal. Those beautiful maple trees in the front yard will be greatly enhanced by appropriately placed small spot lights. The amber glow of a yard light will say “Welcome”. A bright light directed to the house number directs guests to the correct home. You see them in every neighborhood. Someone has figured out that outdoor lighting is important but hasn’t put a lot of thought into it. So they head to the big box store and buy a bunch of those solar powered lights you stick in the ground. You know, the ones that make the yard look like a runway. You’ve invested serious time and money in your home and yard, why cheapen it with this dreadful approach? There are so many better options for creating mood and atmosphere. And also better options for fundamental safety lighting. Take the opportunity to strike a mood and deliver personality. Once you have outlined objectives, walk around the yard at night and envision your plan. Get a true feel for the space in darkness. When you’ve determined your direction, set the fixtures in place and test them at night before permanent installation. Is the light providing the appropriate intensity and atmosphere? Examine how the lighting is casting shadows. Will light be shining in someone’s eyes? Is the light so bright that it washes out the evening sky? Make sure placement is not a lawn care or tripping hazard. Always take care not to shine lights directly into a neighbor’s window. If you’re over 30, halogen has always been the light source of choice. Today, though, LED lights are adding versatility and durability to the mix. The advantages of LED include very long life meaning you won’t have to crawl into shrubs as often to change the bulb. They also stand up well to wind and inclement weather. LED offers the ability to deliver reduced light or to be brightened as needed. This can enhance the landscape by creating a more robust or intricate lighting effect. If you want one less thing to remember, set your outdoor lighting to a timer or choose a dawn-to-dusk feature. These settings can always be over ridden for special occasions, but an automatic process is one less task for you. Whether you are creating a mood or providing safe pathways, outdoor lighting adds to the personality and charm of your home. It’s an opportunity to extend your usable space and enhance your lifestyle. Consider the options. Make a plan. And light up a whole new world.